In 1991, accompanied by botanist Jerry Gorsline, I visited Devils Lake for the first time. I remember being awestruck — in part by the beauty of the place but also because of the many unusual native plants that Jerry raved about. Not one invasive species had reached this place. Jerry worried that telling the story of Devils Lake would bring irresponsible people to the lake, people who could destroy the fragile ecosystem. But he also worried that not telling the story would lead to a massive clearcut on this state-owned land and that this wonderland would slip away. You can read this story online in Chapter 10 of the book “Hood Canal: Splendor at Risk” (PDF 5.2 mb). Jerry and others were successful in limiting the logging, in part because of increasing environmental awareness and a new program called the Timber, Fish and Wildlife Agreement. In 2002, 80 acres containing the lake were permanently set aside as a natural resource conservation area. Now Public Lands Commissioner Peter Goldmark wants to add another 415 acres to the NRCA before he leaves office. The added property, now held in trust for state school construction, would extend the protected habitat to the western shore of Quilcene Bay. To gain special protections, the land would need to go through a process to compensate the trust for the loss of land and timber values. 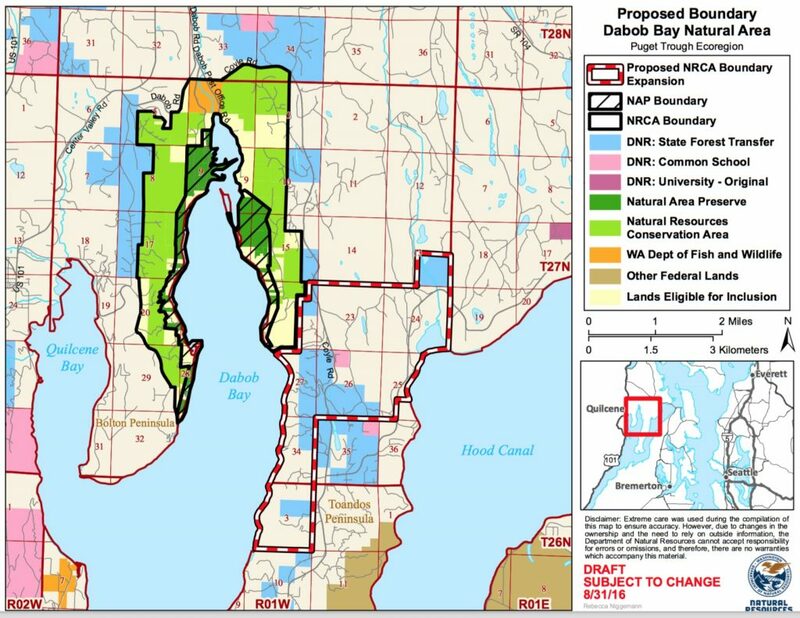 Nearby, the 2,771-acre Dabob Bay natural area — which includes the highly valued natural area preserve and the surrounding NRCA — would increase by 3,640 acres under the expansion plan. About 940 acres is held by the state in trust status. Private lands, totaling 2,700 acres, could be purchased by the state but only from willing sellers. Basic details are provided in a fact sheet from DNR (PDF 318 kb). Peter Bahls, executive director of Northwest Watershed Institute, wrote an article about the plan for Olympic Forest Coalition. Informational discussion: Wednesday, Sept. 28, from 6 to 8 p.m.
Public hearing for comments: Thursday, Oct. 13, from 6 to 8 p.m. Written comments: Information available at the link above. 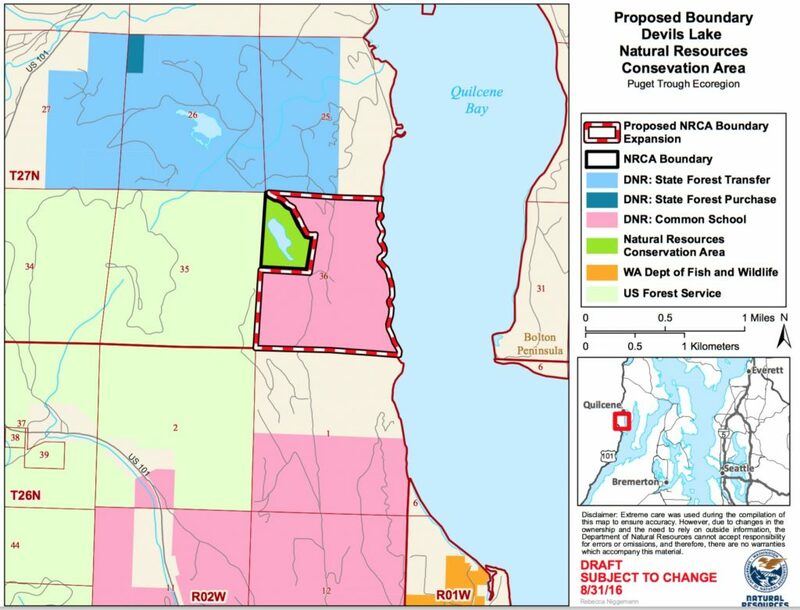 Information on the previous Dabob Bay NRCA expansion and request for related funding can be found in the DNR publication “Dabob Bay Coastal Conservation” (PDF 12.3 mb).